DFP Episode 004 - Welcome Back, Cookie Carnival and a ride on Monorail History. Episode #4 - "Welcome Back, Cookie Carnival and a ride on Monorail History." This show is our first one back since having our son Ryan Thomas on September 28, 2006. Thanks for all of your warm wishes and email asking for more shows. This weeks show will take a trip to the Cookie Carnival, one of Disney's Silly Symphonies Cartoons from 1935. Pinto Colvig, the original voice of Goofy, voices the Hobo in this whimsical trip to the cookie parade. The hobo helps the little cookie girl become the queen. Then she in turn, chooses him for her king. Be sure to catch this animated short in the "Accents On Music" section on Disc 2, of Walt Disney Treasures Silly Symphonies. Tony recommends http://www.dizpins.com/ for good pin collecting information. Santa Claus will be meeting and greeting Magic Kingdom guests at the Tour Guide Gardens next to City Hall. The Osborne Family Spectacle of Lights begins on November 13, 2006 and runs through January 7, 2007. Every evening, you can join Mickey and friends for the nightly tree-lighting ceremony at 6:00pm. Around World Showcase, Storytellers tell tales of their heritage and how the holidays are celebrated in their homeland. Candlelight Processional at the America Gardens Theatre. Illuminations is enhanced for the Holidays. "Let There Be Peace On Earth" with narration by Walter Cronkite will be the finale of this amazing nightly show. Each deluxe resort has a confectionary that the kitchen staff produce for the holidays. DFP Episode 002 - Space Mountain - Back to the Future! We reported in this podcast that the Rockit Mountain was open or in soft openings. This is incorrect and we are sorry. Rockit Mountain is scheduled to open in the Spring of 2007 with the Year of a Million Dreams. It was also stated that the ride will have music of a VanHalen-esc feel. This has not been confirmed. There was talk that because Rockit Mountain was advertised as part of 2006 Grad Nights, a modified version of what was actually planned for the ride, was rushed out in May and June. This modified version was rumored to include VanHalen music. It has not been confirmed that any VanHalen music was used for Grad Nights. Due to a scheduling conflict, Jordyn couldn't join us for this show. She'll be back for the next episode. This show we have a new co-host, Wade Jackson, owner/operator of www.gadvupdates.com This site is a roller coaster enthusiest forum with Six Flags Great Adventure as the main theme park but not limited to just that park. This show we discuss last years rehab to the Disneyland Space Mountain. We compare that ride with the Florida version and give our thoughts and opinions about what should (or shouldn't) be done to bring the Florida version "Back to the Future!" We also have our first Disneyanna Update. We'll try to do our best to bring you up-to-date information in the Disney collectibles world. New WDCC Pirates of the Caribbean Series - First piece titled "It be too late to alter course..." is due out at WDW October 7th and at Disneyland on October 14th. There have been changes to the Dreamfinder and Figment event in WDW. The date has been changed from Sept 9, 2006 to Sept 7, 2006 and will NOT be held at the Oddessy Restaurant in Epcot. It will now be in the Fantasia Ballroom G at the Contemporary Hotel Convention Center. The cost has also been lowered to $260.00 per person. See www.disneygallery.com to register. 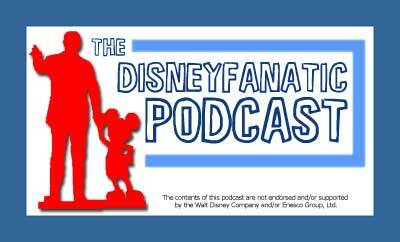 DFP Episode 001 - So you want to work at Disney? www.backstagewest.com - the most trusted place for actors to find news and casting information. http://americanguildofvarietyartistsagva.visualnet.com - American Guild of Variety Artists. Symbiosis - Movie that focused on the fact the earth is under stress by man. (1982-1995) Replaced by Circle of Life. Stay tuned as this podcast will start in the coming weeks.